Snowdrops. Not from my yard but from the site of our upcoming and apparently controversial Civil War Living History. Now truly, if I were going to steal something from this spot, it wouldn’t be shingles. It would be these lovely little beauties. very pretty. don’t burn nearly as nicely as shingles do though. when is this living history thingy? Nah, I’d rather steal ugly old shingles. Pretty! They really look like spring to me. Oh yes, you should give them a good home! There ya go…and they would never miss them! Beautiful!!! Have a Wonderful weekend! Love the snowdrops! They’re just so pretty but, the other commenters are right, snowdrops wouldn’t burn nearly as well as old, worn out, shingles. I thought y’all were stealing the shingles to use for wiping while you pooped on their lawn? Guess not. Get those beauties before someone drops a shingle on them! What a great shot! Lovely! A flower I’ve never seen in person. Thank you. I’m going to try to get a photo of a lizard today. Of course I had one appear next to me yesterday and pose — when I didn’t have the camera. How gorgeous! We did, however, have snowdrops on our lawn yesterday. We’re cold enough today, but so far no more… Thankfully! They are very pretty… but what’s this about shingles? Well, what’s a war without controversy? You know, those Civil War Reanactors are a pretty roudy group, known widely for public urination and the like-kind of like knitters??? Good luck dealing with the “administration”. They’d never notice if you took them. Shingles, yes, pretty flowers, no. Although they’d see the disturbed dirt and assume you had buried your reenactment battle casualties there. I have nothing blooming in my yard yet. Nothing. Gorgeous! I should soon have a ravine carpeted with those lovelies. Can’t wait. Beautiful! I love Spring in the northeast! Oh, too warm here for those! But they’re so lovely. I have some chinodoxia that are practically gulping and wondering WTF? But they’re still growing. hahahhahahahahahhahahahaaaaaaaaaaaa! If, say, hypothetically… I might be in Boston in August for a wedding. And the wedding took place on a thurs and the next day was my B-day…. Hypothetically, could I guilt some boston people into hanging out with me? Because I’m not above that. IF it all turned out that way. Hypothetically. 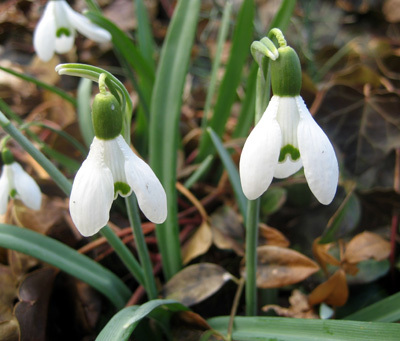 Your photography is wonderful, and the little snowdrops…..make me sigh. Simply. Beautiful. great photo – they almost don’t look real, do they. wow. Those are neato! I don’t think I’ve ever seen those before.